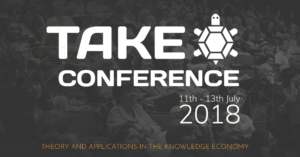 I3U at the TAKE conference: Should innovation policy be evidence-based? Marzenna Weresa of the World Economy Research Institute at the Warsaw School of Economics gave a keynote speech on I3U and the Innovation Union at the TAKE 2018 conference in Poznań, Poland on 11-13 July 2018. Towards innovation union in Europe: Should innovation policy be evidence-based? Nowadays, the European Union is challenged in the global arena by emerging economies as well as by the US in terms of developing innovation and capitalizing on knowledge and technology. The need to elaborate long-term strategic visions for the European Union research and innovation system has been recognized in the “Europe 2020” strategy, especially in its Innovation Union initiative. One of its objectives is to strengthen the European science base and to use scientific evidence in the process of innovation policy-making. The idea of using scientific evidence to shape policies aimed at solving society’s problems has existed since ancient times and can be found in the works of Plato, Aristotle, and Descartes, among others. Today we see an increase in the demand for scientific evidence alongside questions posed to scientists by policy-makers and by the entire society regarding a range of choices in energy, the consequences of climate change, food safety to health care and social exclusion. The main objective of Weresa’s keynote speech was to discuss the direct and indirect effects of the EU innovation policy instruments implemented as an Innovation Union initiative. An emphasis was put on the tools that promote a stronger European dimension of R&D, including an evidence-based approach to policy making. The speech was based on the results of the European Union Horizon 2020 project on “Investigating the Impact of the Innovation Union (I3U)”, (H2020-INSO-2014, grant Agreement: 645884). This entry was posted	on Monday, September 17th, 2018 at 9:53 pm	and is filed under Newsletter 4. You can follow any responses to this entry through the RSS 2.0 feed. Both comments and pings are currently closed.